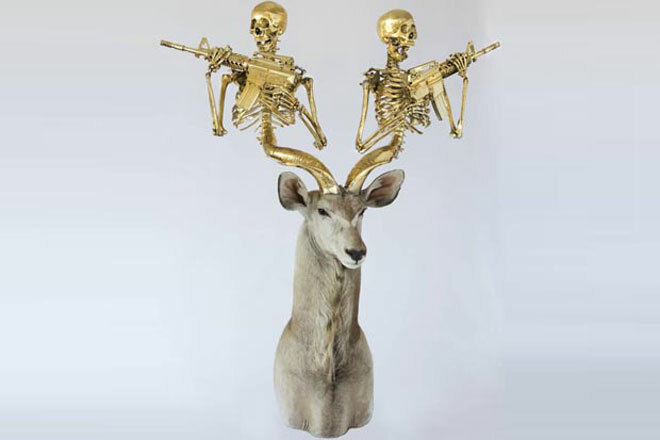 Gun-wielding golden skeletons and other bizarre items get added to stuffed animals' horns in Peter Gronquist's art exhibition, The Evolution Will Be Fabulous. Artist Peter Gronquist has reimagined a collection of hunting-trophy animals with their horns pimped out to feature elaborate weapons and precious metals. The pieces are being exhibited at Gallery 1988 in Los Angeles under the title The Evolution Will Be Fabulous. This follows his series of designer guns featured in a previous show called The Revolution Will Be Fabulous. He has taken taxidermy animals including a buffalo, wildebeest, zebra, rabbits and other creatures and then created extremely ornate horns featuring replica rifles, machine guns and AK47s as well as human skeletons, flowers, luxury brand logos and other such decorative flourishes. He uses aluminum and steel tubing for the outlines, then fiberglass and epoxy clay for the bulk of the form. The gun elements tend to be realistic toy replicas from eBay. Each piece is then sanded for anywhere between 20 and 50 hours before being plated in silver. Some are then coated with a gold paint, but he’s looking into getting them plated in 24 carat gold. You can pick up one of the horned bunnies (titled The Last Unicorns) for $500 apiece. If you’ve got more cash to splash, why not go for the $10,000 kudu? Check out more of Gronquist’s images in Wired UK’s gallery. Or, if you want to buy one of the pieces, head on over to Gronquist’s website. Peter Gronquist makes elaborate additions to taxidermy artists' work.